Here at the Sherry Design studio, we like to try new things and go to exciting events. Our last outing was no exception – one of the most bizarre, nail biting, awkward, yet fascinating events we have experienced to date. We left Sherry Design HQ via bus, sitting at the back like a pack of excited teenagers on a school trip. When we arrived at our destination, we where greeted by a gigantic upturned purple cow, situated on the edge of the River Thames. 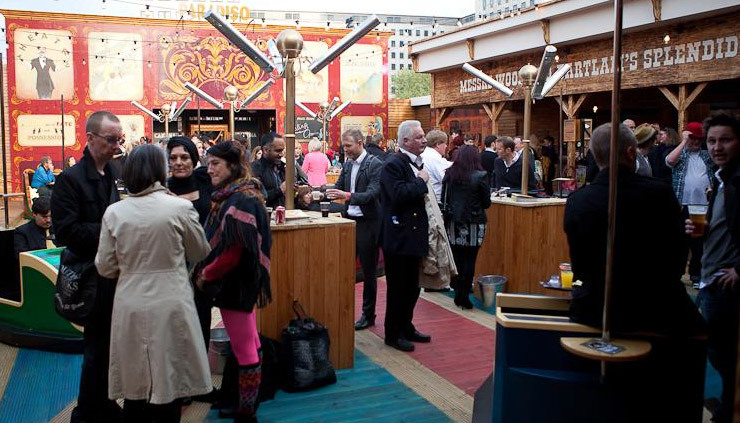 The Southbank Centre is the host for the Underbelly and London Wonderground Festivals, each showcasing a variety of different events from stand-up comedy to contemporary dance. The event we attended was entitled ‘Limbo’. We didn’t really know what to expect – all we knew to expect was a Circus/Cabaret-style show. Scattered around the entrance to the tent were the remains of old fun fair rides, transformed into seating to relax and have a jolly drink while we waited for the show to begin. When the call came we where escorted to our seats, ringside! The tent was decorated with dangling light bulbs suspended from the tent rafters, and mirrors surrounding the walls behind the crowd. The lights dropped and the room waited with excited whispers until a lineup of eight characters appeared including a bearded sousaphone player, a scantily clad female wearing a giant bunny head, a beat-boxing harmonica playing man, and an awkward skinny fellow dressed in a smart suit. It was a grand musical entrance which filled the tent in a rush. Once the show was underway, the energy level didn’t lag at any point – largely attributing to the accompanying music, which was perfectly designed to the performances, embellishing each of the various stunts and visual displays. At many points, performers’ movements were accentuated by the crash of a symbol, the toot of a trumpet or beatbox-style vocal sounds. The highlights of the show included a male acrobat chained at the ankles and wrists, jumping between carefully positioned poles extending from the floor, on one hand! Another notable act demonstrating sheer madness and skill, involved a pole that reached the roof of the tent, on which the man danced and lifted his body around and up the pole. Also worth a mention was a act that involved three men strapped to poles situated within the audience, who proceeded to bend the poles in all directions using bodily force (at many points, coming close enough to touch members of the audience). The entire show was an absolute spectacle and far more stunning and engaging than can be conveyed in words. It was packed with many more unbelievable skills and showmanship, making it exciting from start to finish. And as promised, throughout the show wherever you looked around the tent, there was entertainment. I would highly recommend the show and will probably see it again at some point. Details of the show can be found on the Wonderground website, and since this was just one of the events showcased, there is a lot more to see and do.